A great night out had by all – this is just the show you need to drag you away from the January blues. In future I will always go to a musical on January 2nd, and the more gleeful, glittery and fun the better. 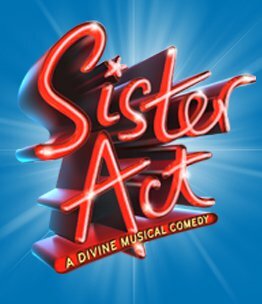 The touring version of Sister Act is in Dublin until the end of the week, when it will return to the UK, hitting venues form Bristol to Aberdeen right up to October. See here for tour dates near you. It will certainly take you far away from returning to work/compiling tax returns/attempting to pay Christmas credit card bills. The thrills of January! The main energy in this production comes from the big ensemble numbers, joyfully combining disco, soul and gospel. As a virgin to the soundtrack, I could still happily hum ‘Raise Your Voice’ 24 hours later, and my eyes are still slightly blinking from the glittering reflections from the costumes. It’s not just glitz and catchy tunes, though – the story taken from the 1992 film still delivers and the characters are still strong. Topped off with music that will have you digging out your copy of the Dreamgirls soundtrack (no bad thing in my book), the parts all sum together for a good-natured, enjoyable, if not ground-breaking, evening. Small bugbears were that the male leads were unconvincing – Curtis never seemed convincingly menacing enough to warrant Delores downing her glad rags, and the romance between her and ‘Sweaty Eddie’ generated less chemistry than can probably be seen between Ashton and Demi these days… However, the supporting actors in Curtis’ gang generated some belly laughs, as did the sisters singing ‘It’s Good to Be a Nun’. Julie Atherton shone as Sister Mary Robert with a great song ‘The Life I Never Led’, which I can see becoming a cabaret staple for musical-theatre inclined soloists (first dibs to me, please!). In sum, a good, solid show with flashes of brilliance and cheer aplenty – you could do a lot worse, and this one’s definitely a crowd-pleaser. Happy new year, readers!